Bon appetit! – Oh, I see! you become aware of that feeling (which we often define as ‘comfort’) shared by others. In other words, maybe you had an omelette at a certain time of the day with some things on your mind or perhaps nothing at all, and you believe it to be the best omelette you’ve had. The reason for this, unclear but you just know it. And then you read something similar about someone else and think, “YES!” (because that overwhelming feeling is indescribable so let’s stick to ‘YES!’). A book that did something similar for me was My Life in France by Julia Child with Alex Prud’homme. It was warm inside, and the dining room was a comfortably old-fashioned brown-and-white space, neither humble nor luxurious. At the far end was an enormous fireplace with a rotary spit, on which something was cooking that sent out heavenly aromas. We were greeted by the maître d’hôtel, a slim middle-aged man with dark hair who carried himself with an air of gentle seriousness. Paul spoke to him, and the maître d’ smiled and said something back in a familiar way, as if they were old friends. Then he led us to a nice table not far from the fireplace. The other customers were all French, and I noticed that they were treated with exactly the same courtesy as we were. Nobody rolled their eyes at us or stuck their nose in the air. Actually, the staff seemed happy to see us. As we sat down, I heard two businessmen in gray suits at the next table asking questions of their waiter, an older, dignified man who gesticulated with a menu and answered them at length. “What are they talking about?” I whispered to Paul. “Wine?” I said. “At lunch?” I had never drunk much wine other than some $1.19 California Burgundy, and certainly not in the middle of the day. Suddenly the dining room filled with wonderfully intermixing aromas that I sort of recognized but couldn’t name. The first smell was something oniony – “shallots,” Paul identified it, “being sautéed in fresh butter.” (“What’s a shallot?” I asked, sheepishly. “You’ll see,” he said.) Then came a warm and winy fragrance from the kitchen, which was probably a delicious sauce being reduced on the stove. This was followed by whiff of something astringent: the salad being tossed in a big ceramic bowl with lemon, wine vinegar, olive oil, and a few shakes of salt and pepper. My stomach gurgled with hunger. I couldn’t help noticing that the waiters carried themselves with a quiet joy, as if their entire mission in life was to make their customers feel comfortable and well tended. One of them glided up to my elbow. Glancing at the menu, Paul asked him questions in rapid-fire French. The waiter seemed to enjoy the back-and-forth with my husband. Oh, how I itched to be in on their conversation! Instead, I smiled and nodded uncomprehendingly, although I tried to absord all that was going on around me. We began our lunch with a half-dozen oysters on the half-shell. I was used to bland oysters from Washington and Massachusetts, which I had never cared much for. But this platter of portugaises had a sensational briny lavor and a smooth texture that was entirely new and surprising. The oysters were served with rounds of pain de seigle, a pale rye bread, with a spread of unsalted butter. Paul explained that, as with wine, the French have “crus” of butter, special regions that produce individually flavoured butters. Beurre de Charentes is a full-bodied butter, usually recommended for pastry dough or general cooking; beurre d’Isigny is a fine, light table butter. It was that delicious Isigny that we spread on our rounds of rye. I closed my eyes and inhaled the rising perfume. Then I lifted a forkful of fish to my mouth, took a bite, and chewed slowly. The flesh of the sole was delicate, with a light but distinct taste of the ocean that blended marvellously with the browned butter. I chewed slowly and swallowed. It was a morsel of perfection. In Pasadena, we used to have broiled mackerel for Friday dinners, codfish balls with egg sauce, “boiled” (poached) salmon on the Fourth of July, and the occasional pan-fried trout when camping in the Sierras. But at La Couronne I experienced fish, and a dining experience, of a higher order than any I’d ever had before. Along with our meal, we happily downed a whole bottle of Pouilly-Fumé, a wonderfully crisp white wine from the Loire Valley. Another revelation! Then came salad verte laced with a lightly acidic vinaigrette. And I tasted my first real baguette- a crisp brown crust giving way to a slightly chewy, rather loosely textured pale-yellow interior, with a faint reminder of wheat and yeast in the odor and taste. Yum! We followed our meal with a leisurely dessert of fromage blanc, and ended with strong, dark café filter. The waiter placed before us a cup topped with a metal canister, which contained coffee grounds and boiling water. With some urging by us impatient drinkers, the water eventually filtered down into the cup below. It was fun, and it provided a distinctive dark brew. Paul paid the bill and chatted with the maître d’, telling him how much he looked forward to going back to Paris for the first time in eighteen years. The maître d’ smiled as he scribbled something on the back of a card. “Tiens,” he said, handling it to me. The Dorin family, who owned La Couronne, also owned a restaurant in Paris, called La Truite, he explained, while Paul translated. On the card he had scribbled a note of introduction for us. “Mairci, monsoor,” I said, with a flash of courage and an accent that sounded bad even to my own ear. The waiter nodded as if it were nothing, and moved off to greet some new customers. Paul and I floated out the door into the brilliant sunshine and cool air. Our first lunch together in France had been absolute perfection. It was the most exciting meal of my life. 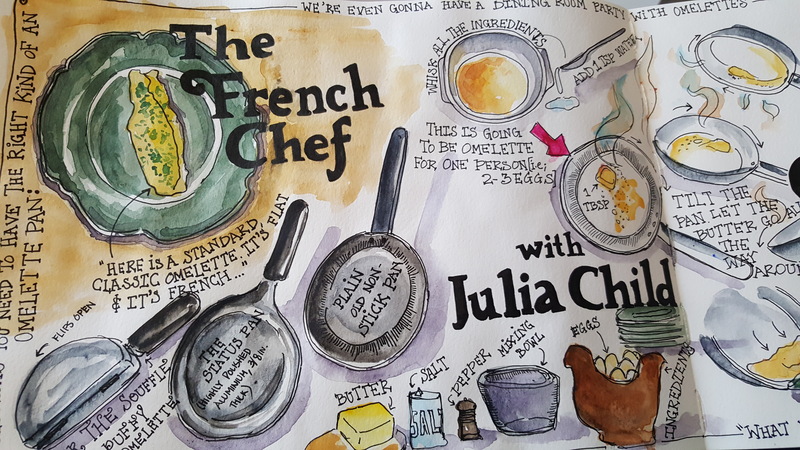 These days, I have been watching episodes of Julia’s show The French Chef on YouTube (Thanks to all the wonderful people posting meaningful content online!). 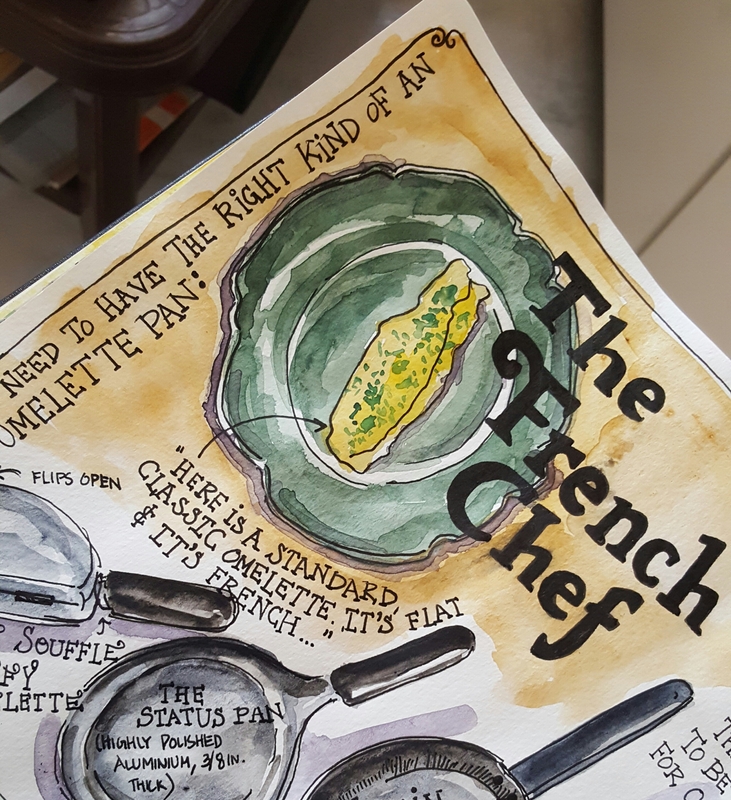 Yesterday, while watching one of those episodes, more specifically, The Omelette Show, I began sketching as Julia instructed her viewers about which pan to opt for the perfect omelette and of course, what really IS a perfect omelette? Previous Post Rapunzel! Rapunzel! Let down your hair!